It is vital to have access to some of the latest office space technologies available. The use of these cutting edge technologies assists employees and increases productivity in your serviced office space. It also puts your business on the whole, on an even playing field with competitors who make use of advanced technologies. The Business Centre provides technology services from the very best technology partners in South Africa. With fibre-optic Internet connections, document centres, server rooms and more, your business will be perfectly placed to enhance your productivity and success. All our centres are enabled and maintained via secure access control cards – ‘your passport’ to and through The Business Centre. Each tenant and employee receives access control cards to move through designated areas in the centre. This ensures all data and equipment is stored securely. Billing systems for document and beverage vending are also controlled via your individual access control card. You can be rest assured that any and all IT support and maintenance needs are taken care of with our in-house IT department. At The Business Centre, we offer efficient on-site technical support, allowing you to focus on your business, thus eliminating the need for an outsourced IT company. Network infrastructure, server rooms and server hosting are all available at The Business Centre. The use of this advanced technology assists your business with a fast Internet connection, as well as hosting your company’s server safely and securely. Should you need to book a meeting room for a training session or presentation to clients, you have peace of mind that our rooms are fully equipped with cutting edge technology. Evoko screens display if the meeting room is occupied or available, and by who via red or green lighting. This is just another complement to the highly developed technology available to you with our office space rental. Digital logo walls displayed through the waiting areas, showcase businesses’ logos in their respective centres. The Business Café digital screens display information about our various other centres nationally. To add to your accessibility, you are welcome to make use of The Internet Café. This assists you and guests in gaining easy access to the Internet for payment methods, emailing or surfing the web. All office space tenants have access to these reliable technologies that can be tailor made to offer you the very best solution for the needs of your business. IT is one of the most important aspects of any small to medium business. At The Business Centre, companies renting office space have access to the in-house IT department who offer assistance with all issues and queries around IT support. Information technology can make or break a business. Ensure you have access to specialists within this field, should anything go wrong, or assistance in IT be needed. At The Business Centre, your IT support is handled in-house, by dedicated and certified technicians. Our on-site team takes care of the maintenance and troubleshooting which is required to keep your company’s computers, network and servers running 99.9% of the time. Should you have an IT issue or query, simply contact the reception service at The Business Centre. Your call will be logged and within 45 minutes, an on-site technician will gladly assist you in your office. This efficient turnaround time allows for you to be up and running without having to wait for an outsourced IT team to help you. Certified technicians have installed a reliable and efficient network infrastructure ensuring fast Internet connectivity and IT security throughout all The Business Centres. Fibre-optic Internet connection in our prime business locations allow you to be constantly connected to the Internet, whether via a network cable or Wi-Fi. Wi-Fi exists throughout all buildings, including the communal areas such as The Business Café and courtyards. Your guests are welcome to make use of our Internet Café, situated in the immediate proximity of The Business Café. Being surrounded by the world-wide-web allows you, and your guests, to optimise productivity at The Business Centre. The Business Centre is able to host your company’s server(s) in one of our secure server rooms. The server is racked and attached directly to your company VLAN (Virtual Local Area Network) on a dedicated 1000Mbps (1GB) connection. Your server(s) needs to be operating effectively and efficiently at all times. At The Business Centre, we understand that hosting servers is crucial, as company data should never be lost. 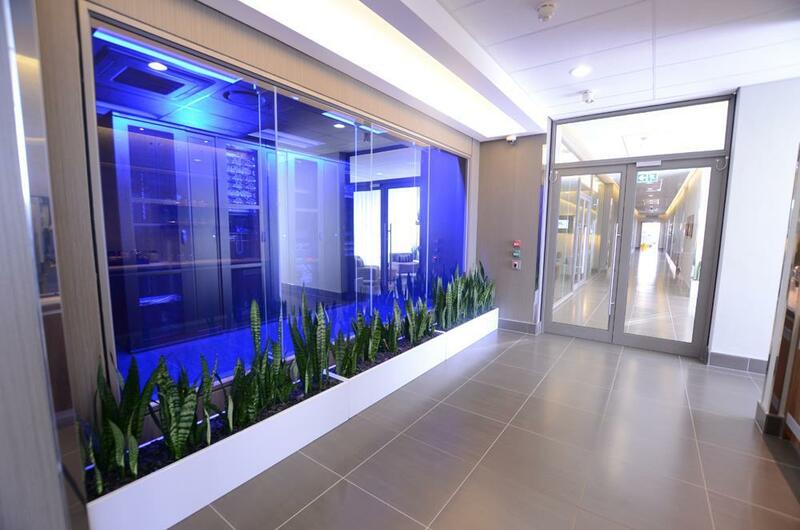 Our server rooms, lit in blue behind large glass windows, are some of the highest quality data centres money can buy and are fully secured. All access control, PABX, security and switchboards are controlled from our server rooms. CCTV cameras that are installed in all centres, send backup data to the server room. Should a power failure occur, all crucial operating equipment maintains uptime through the use of un-interrupted power supplies (UPS) until such time as the backup generators kick in. Security is one of the core components at all our centres. We offer your company server hosting in one of our secure server rooms. The server is racked and attached directly to your company VLAN (Virtual Local Area Network) on a dedicated 1000Mbps (1 GB) connection. This provides you with the peace of mind that not only is your important data secure at all times, but that you have continuous, direct access to it at all times. The Business Centre uses an enhanced, state-of-the-art tracking and secure printing solution at various document centres. This allows companies or individuals to print, scan, copy or fax and is tracked and billed via your customised access control card. The Business Centre uses an enhanced, state-of-the-art tracking and secure document solution. This allows companies or individuals to print, scan, copy or fax via our Ricoh printers, securely via the cloud. Document centres are located on each floor of each Business Centre, and are centralised for convenience. Documents can be printed, scanned, copied or faxed via your individual access control card. When you swipe your card, our Ricoh printers recognise you, and you are billed accordingly. Should you wish to scan, your document will automatically be emailed to your dedicated email address. Printing can be customised to either black and white, grey scale or full colour. As an energy efficient business, we have implemented this advanced technology to save you money as well as save the amount of paper being used on a daily basis. Telecommunication services are also available with Dedicated Company Number (DCN) services, optional direct dialling, and telephone billing. Additional features include standard voicemail and call forwarding. Tele-conferencing facilities are also available at The Business Centre. Should you require to work after hours, be rest assured that our 24 hour surveillance will be on guard as well as beverage centres and vending machines available to you at all times. Meeting rooms are fully equipped with high quality projectors and motorised projector screens. Should you need to draw out strategies in your meetings, make use of our stylish glass writing boards. Voice conferencing and video conferencing facilities are also available with surround sound. Presentations can be displayed on our 50 inch LCD screens, and many of our rooms have split-boardroom configuration. This merges two 12 seater rooms should you wish to host 24 guests at a time. This versatile tool is used to make the most of meetings and allows for businesses to communicate effectively and efficiently with others across the globe. If your business involves any level of consulting, then video conferencing can be a great benefit. Meeting virtually allows for drastic savings in travel and accommodation costs.